Installation, testing and maintenance of fibre optic networks. Faster Networks with Fibre Optic Cabling. Fibre Optic Installations and Maintenance. Fibre Optic Testing and Repair Services. Businesses today are shifting to fibre optic cabling to handle the increasing demand for more bandwidth. Services such as VoIP telephone systems and video conference calls are becoming the norm in day to day business activities. They require a network infrastructure that has the capacity to carry a large amount of data at high speeds. Fibre optic cables are the best option for an optimum communication system. They provide much greater bandwidth, have longer distance capabilities and are much more reliable than other alternatives. Fixtel can offer bigger bandwidth options at minimum costs. We can individually design fibre optic solutions to suit any business needs. Fixtel provides safe, high quality services delivered on time. We ensure that there is minimum downtime, so your business can operate at full capacity as soon as possible. Fixtel are specialists in fibre optic design and installations. All our technicians have ACA optic fibre endorsements and are experienced in fibre optic terminating and splicing methods. We install and terminate all types of fibre optics including fault finding, network audits and fusion splicing. Fibre optic splicing and termination requires specific tools and kits for cutting, finishing and joining fibre optic cables. Our experienced team use the latest high-quality equipment which allows for greater efficiency in the installation process. 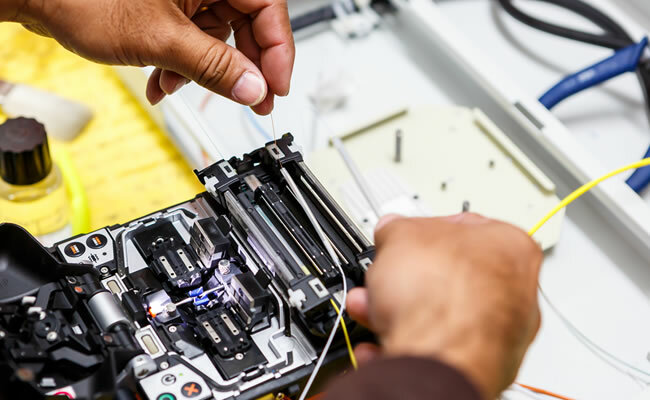 Our splicing and testing equipment are carrier grade and are calibrated on a regular basis to ensure that your optic fibre network is without disruptions. We stay up to date with the latest fibre optic technology and always follow national wiring standards, so you can be certain that our work is always done to the highest quality. Our aim is to deliver increased speeds in data transmission and to decrease interruptions to the signal. Which gives your business greater day to day efficiency and lower running costs. If your business is experiencing data or communication connectivity issues, your fibre network infrastructure might not have been installed properly. Our technicians conduct fibre testing and repairs to see if your optic fibre cables are properly installed and terminated. We conduct tests for continuity and end-to-end loss to troubleshoot and fix any business cabling issues. With technology consistently evolving, a lot of businesses upgrade and replace their outdated hardware but only a few of them think about replacing their existing cabling which could have been slowing down their new equipment. Our team replace your existing structure for better performance. We can also take your old fibre optic product and make it new again to ensure that your system will always operate with optimum performance. Our fibre optic technicians endeavour to fix all data cabling problems as quickly as possible to ensure that there are little to no disruptions to the day to day running of your business and reduce downtime as much as possible.